These are a range of models from Khurasan recently added to the collection. I have plans for a Prime infected game (From the Heliopause Gruntz setting) on the space station board where the initial engagement will be between some infected and converted colonists and the Hasmat suits before harder battle is played out between Federal Army marines and the aliens themselves. All of these are based with my standard of a 5pence piece. I find 1p a little on the large size and I don't like the big raised lip you would have if you used the mini-slotta type bases. The weight of the 5pence piece is great for reducing topple in 15mm models and it looks in-scale with the small models. 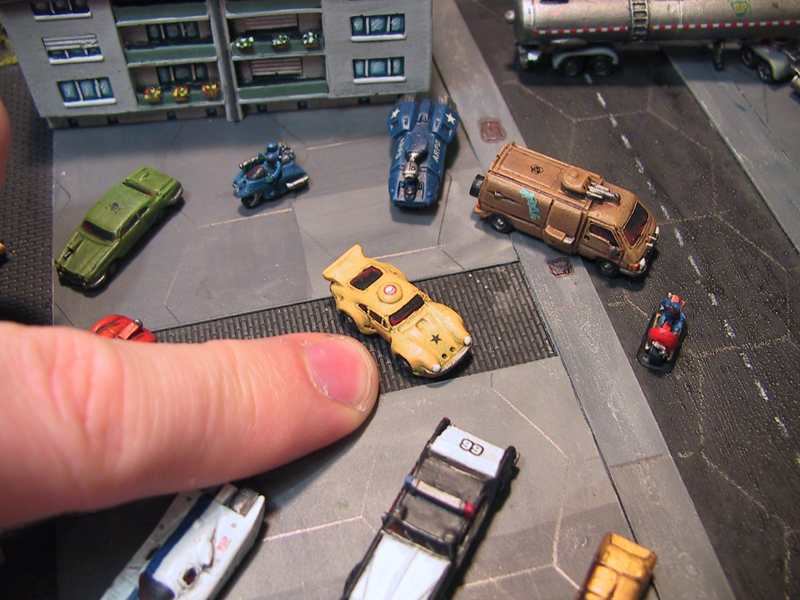 Larger figures are put on 1pence pieces and Gruntz Specialists and Commanders are based on 2pence. Federal Hasmat suit types with weapons. Infected by Prime alien spawn. 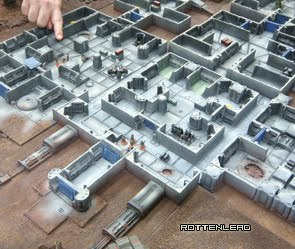 This is the terrain planned for the Prime infected battle at Salute. Resin terrain from Ainsty casting and construction and airbrushing by me in 2004. Two ARM squads for the Heliopause Gruntz setting (models evil troopers from Khurasan). For those interested, here is some background story from a section of the Gruntz rules about the Prime. Makken’s face dripped with sweat and his ears rung with the screeching whine of the whirring Gatling Rail Cannon’s rotating barrel. The ground around him was strewn with red hot casing that the gun spat out disgustedly in a brassy waterfall. The GRC was supposed to be used to take out fast moving skimmers or lightly armoured APC’s but right now Jerrit Makken swept it in wide arcs mowing down Prime warriors with brutal ease; the high velocity rounds passing through multiple aliens as they coursed through the air. It was grim work as the unrelenting horde refused to give ground; their basalt coloured corpses stopped 15 feet from where Makken was holed up underneath one of the Mule skimmers and were 4 feet high if it was an inch. Then they stopped. No Prime came clambering over the bodies of its fallen brethren; Makken let the gun barrel spin down and looked around the makeshift perimeter. “One hundred yards – volley fire – FIRE!” bellowed Sergeant Lippham his lips cracked from the burning sun and the screaming of orders. A sharp crack of laser fire rang out around the valley as the platoon poured it’s small arms fire into the onrushing Primes; shadowy figures fell to the ground the white hot pock marks of the laser strikes glowing against their dark flesh. The sound of laser fire broke up like the pattering of rain broke out as individual troopers picked their shots; howling gushes of Nitromethane added their voice to the concert of killing and the occasional dull crump of a Personal Ordnance Missile weighed in with their heavy percussion. And still the Prime came on. Lippham caught a glimpse of Forbes firing a pistol in each hand, his face contorted with hatred and smeared with the dust from the heavy roll he took down the valley wall to warn the relief column of its impending danger. The Major so calm, so polite normally was screaming blasphemies upon the enemy. A man not 10 feet from the officer was spun around as a Prime dashed away his face with one mighty blow; gore sprayed up into the air like a grotesque rainbow showering those unfortunate enough to be near the poor man before a quick witted trooper gutted the beast with his Iridium combat blade. Still the Prime jerked towards the nearest man even with its innards spilling across the dry earth before even it’s mighty frame twitched still. Then they stopped. Corpses littered the valley floor but no more Primes appeared. Lippham turned on his heel. And went to find the Major. Major Forbes shot another Prime in the face; the dark ichor misted up in front of his goggled eyes as the creature sank to its knees. He shot another in the spine it arched double exposing it’s rib cage to the trooper it was tangling with; the man needed no further invitation and coldly ran the creature through. The tip of his blade glinted out of the other side of the Prime and Wripley grimly smiled the mouth bending upwards to crack the desiccated corners. Then they stopped. Sergeant Lippham approached across the charnel scene. Great looking minis and nice idea for using them. And the back ground story was very good too. Cheers. Great total package for demo gaming. I must get some of those infected scientists! Amazing! I'm a big fan of Khurasan's minis and to bad they can't manage to come to salute. I anxious about the Salute gruntz demo. Love seeing your heliopause setting getting some more press. Thanks Thorlongus! I hope I can see you at SaluteNnavarro.